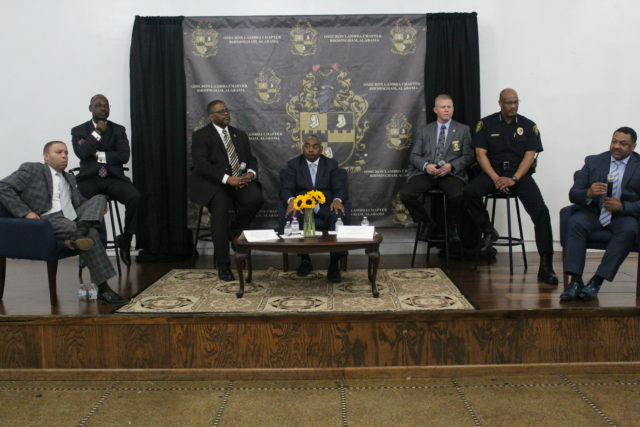 With a “disproportionate” number of African American boys and men killed and incarcerated in Jefferson County and surrounding cities, Alpha Phi Alpha Fraternity, Omicron Lambda Chapter, last week invited top Birmingham area law enforcement leaders to discuss the crisis. Among the speakers were Mark Pettway, Jefferson County Sheriff; Patrick Smith; Birmingham Police Chief and Danny Carr, Jefferson County District Attorney. Also present were judges and other officials involved with the criminal justice system. The event drew more than 200, mostly African-American males. Smith also pointed out the prevalence of handguns in violence. For instance, he said area law enforcement took 2,400 handguns off the streets in 2018. Another 211 were confiscated in January. A number of factors need to be addressed, said the participants. 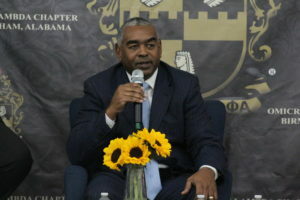 Carr, who in 2018 became the first black person to win office as Jefferson County District Attorney, said the community must work to eradicate the “don’t snitch” code that exists in some neighborhoods. “We can’t prosecute unless we have a witness,” said Carr. “But, your homeboy won’t talk. Sometimes it is the same two families shooting (at each other) but no one will tell,” said Carr, a Ensley native whose younger brother was murdered in 2001. 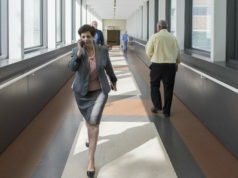 Carr acknowledged that the criminal justice system is severely “imbalanced” in its treatment of African American men. And, he stated that a person’s reception in the courts may also hinge on his or her zip codes. “Also, levied fines are penalties. Many people don’t have the money to pay the fines and often we are funding courts on the backs of poor people,” he said. organize and form ways to mentor youths so that they will stay in school and avoid the so-called “school to prison” pipeline. Smith said the controversial police shooting in Ferguson, Missouri in August, 2015 tarnished the image of law enforcement across the U.S. in the eyes of many. He stated that departments must do a better job at training and teaching officers how to communicate. The police chief said he has tried to create dialogue with youths through activities such as a teen summit, and a police cadet program. And, he promotes more input from Hispanics and the LGBTQ (lesbian, gay, bisexual, transsexual and questioning) communities to help with police sensitivity. 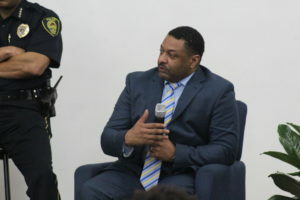 Lawson State Community College Police Chief James Blanton noted that many youths lack conflict resolution skills. When some parents are brought in to help de-escalate situations, it becomes obvious where the child learned his or her behavior from, he said. 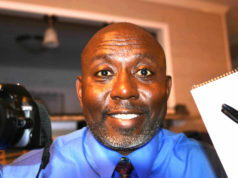 “The hand that rocks the cradle, is the hand that rocks the world,” said Blanton, a former Birmingham police officer. Fairfield Police Chief Nick Dyer said youths must be taught life skills that change their lives for the better and avoid making mistakes that chart the path their entire lives will take. 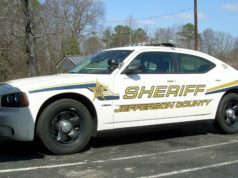 Jefferson County Circuit Judge Michael Streety said there is misconception that crime only stems from low income areas. The mindset must be changed and he suggested that ministers do more to channel access to youths on the margins of the community. Others present on the stage were Michael Williams, the Secret Service’s special agent in charge for Alabama and Mississippi; Moderator Anre Faush; and Lawson State Community College Police Chief James Blanton.